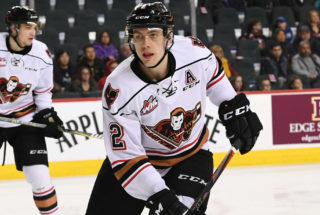 The Hitmen kicked off the mini two-game trip with a 5-2 victory over the Regina Pats Tuesday night for their third straight win and ninth win in their last 12 games. Mark Kastelic and Carson Focht both scored a pair of goals with James Malm adding a single marker. Both Kaden Elder and Kastelic led the way with three points each, as Kastelic added an assist to go along with his two goals while Elder played the role of playmaker with three assists. Jack McNaughton put on yet another strong performance ending with 21 saves. Regina saw a couple of powerplay goals from Austin Pratt and Sergei Alkhimov with Max Paddock making 33 saves. 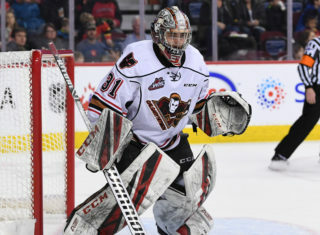 The Hitmen got off to a quick start as they started the contest outshooting the Pats 7-0 when Kastelic buried a rebound shot that went off his back leg initially, but the captain was able to get it to his stick to beat the Pats goaltender. After Regina tied things up off a deflection in front of McNaughton, Kastelic would strike again as Elder made a remarkable pass over to the uncovered Kastelic who would one-time it home for his team-leading 32nd of the season. The Pats would once again tie the game up on a similar looking play in the second period but with five minutes to go in the stanza, the Hitmen would once again find the go-ahead marker. 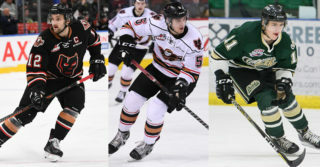 With four skaters on each side the Hitmen would work it around like a powerplay which saw Focht show off soft hands by creating room and firing as wrister into the top corner. With 27 seconds left in the period, the hometown kid struck again as Kastelic was able to find him backdoor for the easy tap in goal to make it a 4-2 lead headed into the third. 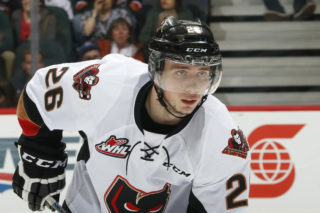 Malm would add some more insurance while on the powerplay as Vladislav Yeryomenko faked a shot that froze everyone and zipped it over the forward who had a wide open net to fire home his 18th on the year. 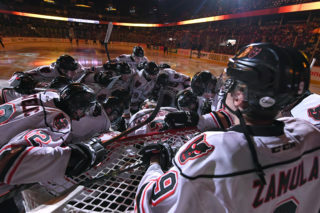 With the win, the Hitmen now move within six points of both Lethrbridge and Medicine Hat in the Central Division and six points up on the Wheat Kings as of now for the final wildcard spot in the Eastern Conference. They’ll be back in action tomorrow night as they’ll head to Swift Current to take on the Broncos for the second meeting of the season.